This page features a free printable Map Of Pennsylvania. 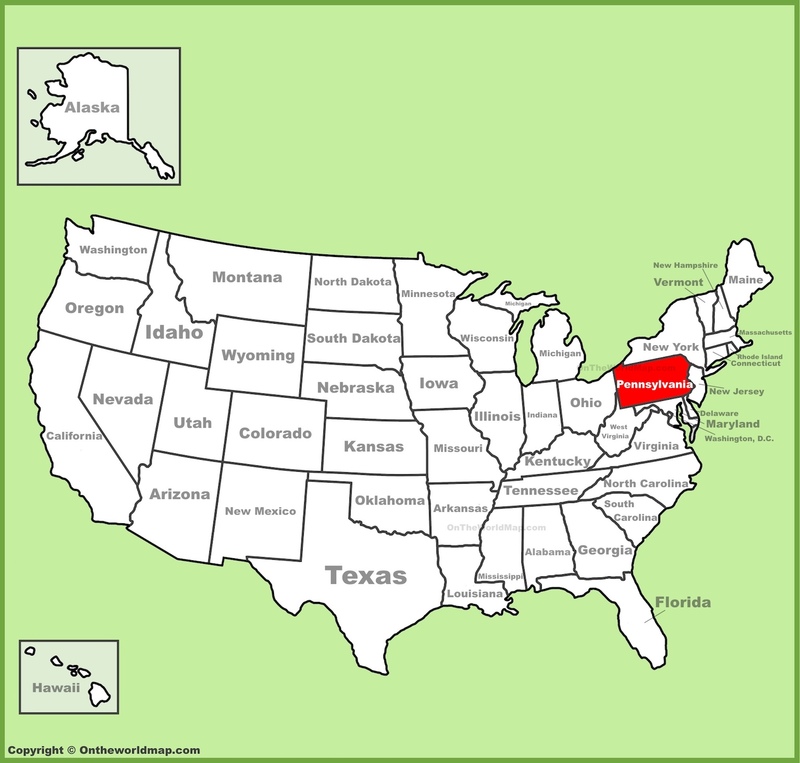 The above US map shows the location of the state of Pennsylvania in relation to other US states. On December 12th of 1787, Pennsylvania became the 2nd of 50 states admitted to the Union, and was one of the original 13 colonies. Scroll down to find fascinating facts about the state of Pennsylvania. Pennsylvania was the first state to put its website address on its license plates. The first baseball stadium was built in Pittsburgh in 1909. The first automobile service station opened in Pittsburgh in 1913. Pennsylvania is one of four states that is a "commonwealth," which has no legal meaning in America today. Philadelphia was home to America's first department store. It was called Wanamaker's. Pennsylvania has the world's largest Amish population. Kennett Square, Pennsylvania is dubbed The Mushroom Capital Of The World, for the one million pounds of mushrooms produced there every year. Visit the town's annual Mushroom Festival on the first week after Labor Day. Ben Franklin started America's first zoo in Philadelphia, and also established America's First Public Library. The Billy Joel song called Allentown is actually about the neighboring city of Bethlehem, but the word "Allentown" was easier to find rhymes for. Scrapple is Pennsylvania's version of Spam. This composite meat product made from ground pig parts is a source of tremendous local pride. Above: A Map Of Pennsylvania.